Initially we were confused by much of the pottery in the collection which did not look Roman so we dug a little deeper. The larger vessels had been packed with newsprint for storage. This newsprint was from London and Kitchener, Ontario newspapers and dated to 1947, which was three years before the Roman collection arrived. Given that the Roman collection would have been located on Western University campus at the time it was packed for storage, it seemed unlikely that old newspapers would have been used in the packing. Therefore, it now seemed very plausible we had two separate collections acquired at different times. Adding to the mystery, along with the newspaper, we found a number of smaller artefacts stored beneath the newspaper; these included two cuneiform foundation cones. Gudea, ruler of Lagas, made things function as they should (and) he built and restored for him his Eninnu, the Whit Thunderbird." the one who built the temple of the god Enki in Eridu." Foundation cones were embedded into the foundations of Ancient Mesopotamian (modern day Iraq and Syria) buildings during their construction. Written on these cones in the cuneiform script were dedications to local deities and the ruling king. Therefore, these cones can indicate the place and time of the second collection: sometime within 3400 B.C.E - 100 C.E. Mesopotamia. Although, we now knew when these artefacts had originated, we had yet to determine where (the specific archaeological site), and how they arrived in Canada. After thoroughly examining the artefacts in the collection, we found that one set of numbers on many of the artefacts was probably the key to determining which archaeological site the artefacts belonged to. The construction of these numbers is U.#####. This number seemed to be an excavation number (designated during or shortly after excavation to maintain records). Therefore, all we had to do was locate the archaeological site which used this construction. 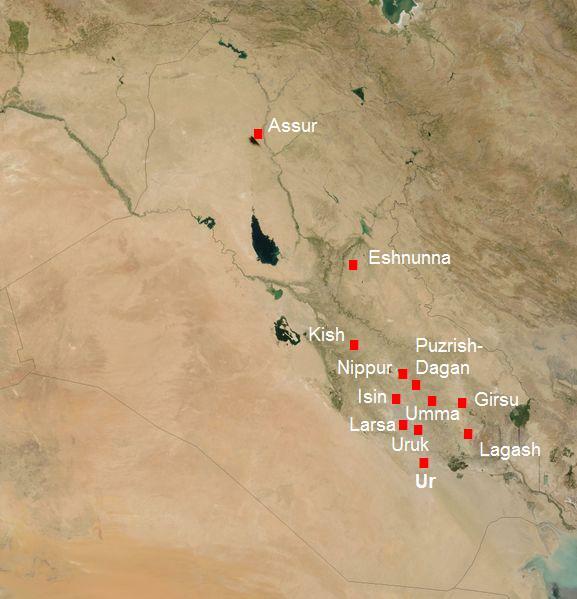 During our undergraduate studies, we had studied Mesopotamian archaeological sites. With an educated guess we searched 'Ur archaeology' online. We stumbled upon a PDF of Leonard Woolley’s published excavation reports; searched the report for “U.” and Bingo! The artefacts were now identified as from the excavations at Ur by Sir Charles Leonard Woolley between 1922-1934; this identification was solidified by Woolley's initials, C.L.W., handwritten on the tag of a small copper sewing needle (at right). Twelve seasons of excavations at the archaeological site of Ur began in 1922 as a joint expedition between the British Museum, London and the University of Pennsylvania led by site director Charles Leonard Woolley. The excavations ceased in 1934 after the onset of the Great Depression and no more funding was available. In the first seasons of excavation, Woolley focused on the monumental public buildings, including the Ziggurat. In later seasons, he focused attention on the burials at the Royal Cemetery. To date there have been no further formal excavations at Ur. Abraham (Abram) is a central figure in Jewish, Christian and Islamic beliefs. It is written that he was a patriarch of man tribes and was said to be a descendant of Noah (the great ark builder). Abraham is also said to be an ancestor of both Jesus and Muhammad. The Bible states that Abraham came from a city called Ur Kasdim, "Ur of the Chaldees." This has often been interpreted as being the city of Ur, excavated by C.L.Woolley. Woolley believed that this was the city of Abraham and there was much excitement at the time of excavation. However, there has not been any concrete evidence uncovered at the site to lead archaeologists to determine that this was in fact the city of Abraham. Sir Charles Leonard Woolley (1880-1960) led the excavations at Ur from 1922 until 1934. His archaeological career began in 1905 when he was an assistant in the department of Antiquities at the Ashmolean Museum, Oxford. Before Ur, Woolley excavated in Northern England, Nubia (northern Sudan), Egypt, and was Excavation Director at Carchemish (southwestern Turkey). Leonard Woolley is one of the first archaeologists to use modern methods to record his sites, publishing his reports extensively. Leonard Woolley was knighted in 1935 for his contributions to modern archaeology. Sir Max Mallowan (1904 - 1978) was assistant to Leonard Woolley at Ur from 1925 to 1929. He met his wife, mystery writer Agatha Christie, while she was visiting the site in 1928. The couple married in 1930 and worked on many more archaeological sites together, including Chagar Bazar and Tell Brak (both in northern Syria). "The sight of the Royal Cemetery when we were in full cry was amazing- and I recall that one of the royal tombs, which contained no less than 74 bodies buried alive at the bottom of the deep royal shaft, appeared, when exposed, to be a golden carpet ornamented with the beech leaf head-dresses of the ladies of the court, and overlaid by gold and silver harps and lyres which played the funeral dirge to the end." Gertrude Bell (1868 - 1926), who had studied history at Oxford, was a frequent visitor to Ur. In 1922, she was appointed honourary director of antiquities in Baghdad by King Faisal of Iraq. She created the Iraq Museum in Baghdad. She was responsible for determining how the artefacts excavated at Ur would be divided between the British Museum, University of Pennsylvania and the Iraq Museum, ensuring Iraq maintained its share of artefacts. Gertrude Bell was a writer, archaeologist, cartographer and a pioneer in desert travel. She also gathered information for the British, while in Mesopotamia behind enemy lines, in WWI. After her death in 1926 her estate helped to establish the British School of Archaeology in Iraq.